The U.S. Embassy in Port Moresby has congratulated the government and people of Vanuatu, Solomon Islands, and Papua New Guinea on the historic occasion of the high-level signing ceremony for the Paris Agreement. 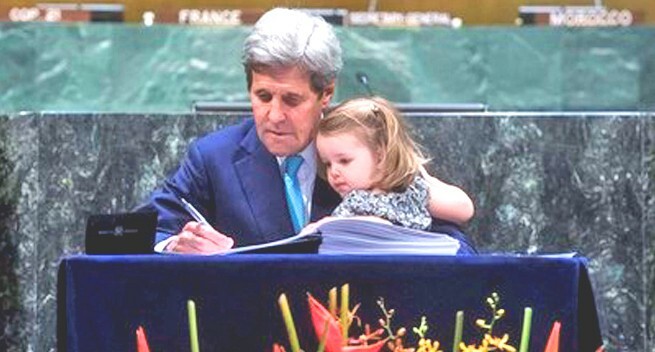 On Earth Day, April 22, the U.S. Secretary of State John Kerry joined a record number of global leaders at the historic ceremony for the Paris Agreement at the United Nations (UN) headquarters in New York. The ceremony, convened by UN Secretary-General Ban Ki-moon, was the first step in implementing the Paris Agreement adopted in Paris, France, on December 12, 2015, during the 21st session of the Conference of the Parties (COP21). Friday, April 22 was the 46th anniversary of Earth Day, which was first celebrated in 1970. 175 countries signed the Paris Agreement at the UN headquarters. This historic figure tops the previous record of 119 signatures for an opening day signing for an international agreement. Joining U.S. Secretary of State for the signing ceremony were Prime Minister of Vanuatu, Charlot Salwai, Minister for Foreign Affairs and External Trade of the Solomon Islands Milner Tozaka and Ambassador of Papua New Guinea to the United States Rupa Mulina. During his remarks at the UN signing ceremony, U.S. Secretary of State Kerry said, “today we know - the new energy future, the efficiencies, the alternative resources, the clean options – none of what we have to achieve is beyond our capacity technologically. The only question is whether it is beyond our collective resolve.” Secretary Kerry stressed the urgency to act, as global temperatures trend upward and polar ice melts at alarming rates. Now that the Paris Agreement is signed, the United States will take the necessary domestic steps to join the Agreement. U.S. President Barack Obama has announced the United States’ intent to join the Agreement this year -- a step that would not require U.S. Congressional action. The Paris Agreement will enter into force 30 days after at least 55 nations representing at least 55 percent of global emissions formally join the agreement. The signing ceremony, timed to coincide with Earth Day 2016, sent a powerful signal that our countries and our leaders are serious about global efforts to address climate change. This swift action by so many countries, including Papua New Guinea, Solomon Islands, and Vanuatu, is a testament to the undeniable momentum coming out of Paris. Such momentum is spurring not only swift action on the Paris Agreement, but continued progress on our collective move toward clean energy economies and a low-carbon future. The global cry for climate action is louder than ever. The science is more irrefutable than ever. The ravages of climate change are more threatening than ever. And we are acting faster than ever to confront this threat and transition to a clean energy economy. The historic signing ceremony at the UN on Earth Day 2016 marks an important benchmark in that process.